Since people prefer to stay updated with their Facebook network, ZONG offers Facebook mobile alerts. Subscribers can now be sent alerts that keep them up to date on their favorite social network, without being online. Next, the user will click Mobile tab as shown above. Users will click Register to Facebook Text Messages. ZONG users will be required to select “Pakistan” as country and “ZONG” as carrier and click next. User will be asked to send “f” to 32665 from their mobile handset to get confirmation code. The letter “f” needs to be sent without quotes. Enter confirmation code in the opened dialog box and click confirm. 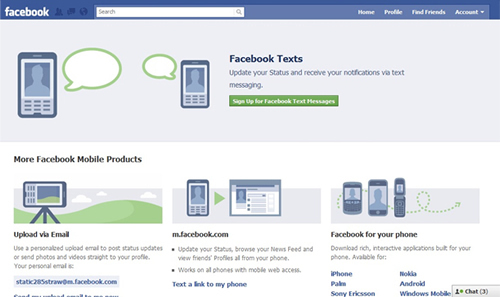 User will then be directed to the notification setup page and will be confirmed about their Facebook Text Messages activation feature. On this page users can edit all notification settings e.g. what kind of notifications to receive, what should be the time of notification, number of notifications to be received, etc. To save setting users will be required to click Save Preferences button. Users can also add multiple phone numbers to a single profile or remove existing phone numbers as well, however notifications will only be sent to a single number. All SMS sent to 32665 will be charged Re 1 plus tax. All notifications received are free of charge. Send <new status message> to 32665, e.g. “I’m in at a party” to 32665. There is no need to use inverted commas. Send “Find <friend’s name>” to 32665 e.g., “Find Salman” to 32665 and get their information on name, e-mail, status, marital status, mobile number and more. Send “Add <friend’s name>” to 32665 e.g., “Add Salman” to 32665. User will get a list of people matching their criteria with closest matches of their friend’s name. Send “Email <friend’s name>” to 32665 e.g. “Email Salman”. User friend has to be on facebook to retrieve the email address. Send “OFF” to 32665. User will no longer be able to receive notifications on their handset. Send “ON” to 32665. User will start receiving notifications again. However user already needs to be a registered user to SMS mobile notifications. ZONG users can also reply to notifications they receive. Following is detailed list and format of notifications received on user handset. User will only be required to reply to the notifications. You have been poked on Facebook by <Friend Name> Reply ‘P’ to poke <Friend Name> back. Facebook msg from <Friend Name> Subj: <subject> <Message Text> …(‘n’ for next) Reply to msg <Friend Name> back. <Friend Name> wrote on your Facebook wall: <Message Text> …(‘n’ for next) Reply to msg <Friend Name> back. User can only reply back to message when they have read the complete message. To read remaining message they will reply back to SMS with “n”. Reply to this message will be posted on friend’s wall. <Friend Name> has requested to add you as a friend on Facebook. Reply ‘add’ to add, or ‘info’ to get profile. Users can view the posted photo or comment on the photo by visiting the <photo-link> link on their handset. This would require GPRS activated handset to access the link. Once a user is logged in, they will acquire a unique Facebook-MMS Email ID as shown below. They can find the Email ID under Upload via Email heading. For example purposes only, the Email ID for the logged in account whose snapshot is attached is:[email protected]. Or users can simply click “Send my upload email to me now” link under Upload via Email heading and then can receive their unique Facebook-MMS Email ID on their email or mobile handset. To upload a picture from mobile, user will only be required to MMS their picture to the provided Facebook-MMS Email ID and their uploaded picture will appear on their Facebook under Mobile Upload album. bhai 2 weeks pahla to zong pr ma na isa activate kiya ap kasa bol satka ho k ya 5 din pahla aya? i already sent email to propakistani admin by 1 week ago about zong support facebook. I already use it and its old. Yj136 blah blah blah :P are you jealous? what news do you have about other telecoms which propakistani is not posting? is site per aisi hi news milengi, ab sports ya entertainment news to post karenge nahi Propakistani wale. Thank you ZoNG! Love U! can some one tell me, about my number sarts from 0333 bt it is converted to zong. How to use this service on this number?